What do you mean? Like there's another force using the Silents for their own agenda? I thought this too for a while. I thought the Voice from The Pandorica Opens was a third party, an external force since it does not match the hoarse voice of the Silents. It's high and cackling. I thought it would be Omega or something. But in Confidential they said the voice was the Silence, and that sort of dispelled that theory for me. 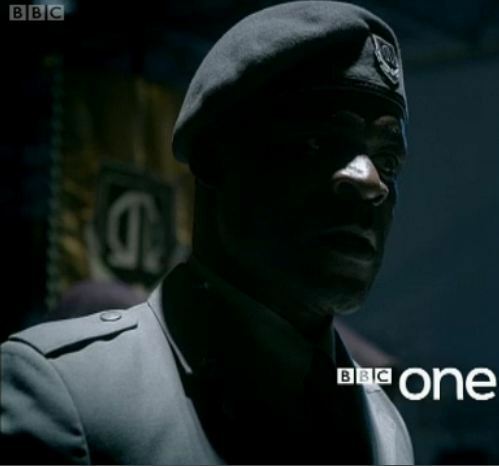 It would slightly disappointing if the Silents, arguably Moffat's greatest creation since the Weeping Angels, who have manipulated humanity for centuries, who kidnapped Amy and who undoubtedly have a secret masterplan (since Moffat said they were the main bad guys for series 6)...were revealed to be nothing more than pawns. Ape, I'm telling you, Time Lord spit has the effect of making people submit. Maybe the Doctor accidentally let a bit of spit fly onto Amy at the end of of Flesh and Stone? Maybe the blue guy's the leader? What I want to know is where they get their suits. Hmm, a friend seems to think that the Flesh lead to the cyber-men due to the Doctor saying it's 'Early technology'. I had a nice retort to this, but the effect of posting it would be lowering this thread to depths it should never sink to. Hmm, I'm sure Moffat would approve. He's Scottish like us. Also, I'm sure he had no qualms in greenlighting an episode that involves white gloopy stuff? The Silence have to be behind it in some way. Without going into spoilers about them, think about it. Moffat said they would be the main bad guys for series 6. Isn't it a little weird they were defeated so easily? That too in episode 2 and so early on in the series. These are the guys that were responsible for the TARDIS blowing up. They kidnapped Amy and kept her for days. They told her she would bring the Silence. Kovarian delivered a baby. Bringing the silence is like bringing a baby. The baby is the Silence? And they were defeated to show up again in 2011 to witness the Doctor's death. They have to be in episode 7 or 8. Silence also hasn't fallen. Yet. Hm, it does make you wonder where their main force or point of origin is. In Vampires of Venice, the lady said that through some cracks they saw Silence and that they fled from the Silence. So it can't just be confined to Earth. Cyber-Men are in the midseason finale? Definitely not just earth. I think we've only seen tip of iceberg with them, I kinda imagine a mother silence kinda spewing out these suited silents! so it doesn't have to be a Silent to 'bring the silence'. Oh and to people saying they will be dissapointed if x happens or it turns out Y is Z, really? It's not simply a matter of what happens but how and why and what it means for the future of the show. It's not like they are just going to start next episode 'oh and River is really a timelady/ clone/ daughter/ mother/oompa loompa ...' and carry as normal. That was a weird ending. I have no theories. It's a shame we had to have such a mediocre double parter to get to that cliffhanger. Just had a thought. You guys all said that the clone Amy switch must have happened before TIA, but she thought she was pregnant. This could be real Amy and then the clone Amy said she wasn't pregnant. Switch between these events? And Kovarian appeared afterwards I think. Also, the Doctor made Amy and Rory sleep in the bunk beds to prevent Rory becoming a GangerBanger. Clever guy. So we all know Amy gives birth and we've seen a picture of Amy with a baby and then there's the regenerating girl but maybe it's not as simple as Amy being the girl's mother. We've had reports of twins being used in the filming and it could simply be that they used twins to film the same baby but then again there have also been spoilers about two babies and a picture of two cots one TARDIS blue and one a cyber type thing so maybe Amy has twins. One of them is the regenerated girl and one of them is River. Confused? Well there's still the whole aborted timeline thing and I'll go into more detail later if anyone wants me to but one baby ie the regenerating girl is created specifically for the Silence/Madam Kovarian and the other one is River? Also who is this from the trailer?